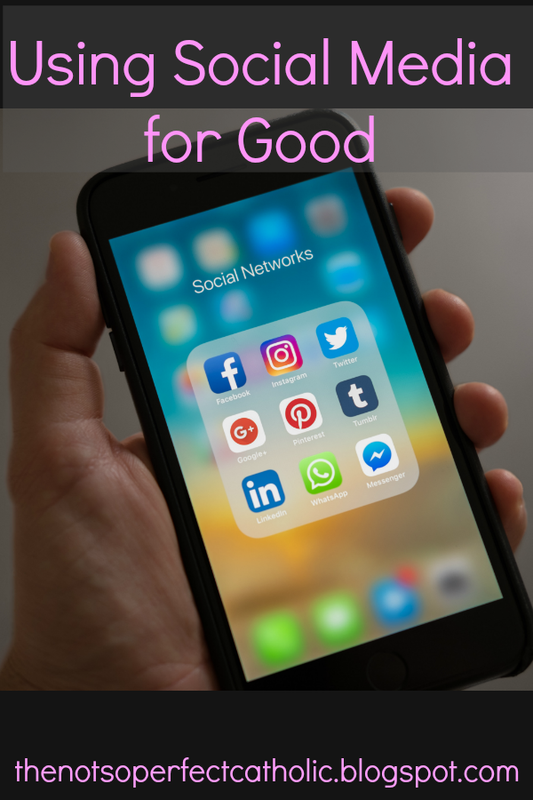 Social Media can be a good thing if it's used for good. For the most part, the people I follow on Facebook, Instagram, and Twitter do just that. Basically, the people I choose to follow aren't those who post lewd comments/pictures and have positive posts. I'm not saying that every post I see is like that, but you can make that choice to only follow positive influences. It's definitely a choice. The First Commandment states: I am the Lord, thy God. Thou shalt not have strange gods before me. Well, social media is definitely one strange god, that's for sure! It can be addictive and it can draw you away from having real relationships. It can definitely keep you from having a real relationship with God. If all of your spare time is focused on seeing what you missed on social media or watching clips from YouTube, where's your time for God? Where is your time for your family? Walk around town and count how many people are constantly checking their phone. Now we have "smartwatches" so all people have to do is look at their wrists to "stay connected". They don't even have to exert any extra energy by pulling their phones out of their pockets/purses...they only have to look at their wrists! I am by no means saying I'm perfect and have never checked my phone constantly. This past Lent I started putting my phone on silent mode. I was able to be more dedicated to my job and actually didn't mind not being strapped to my phone. It was actually quite freeing! I liked it so much that I continued that practice. Social media is becoming a kind of "god"...some people can't do without it. By spending every bit of free time checking whatever form they prefer, they are worshipping social media. Just enjoy the moment you're in. In Matthew Kelly's book The Biggest Lie in the History of Christianity, he discusses social media. He discusses how being so enthralled by social media keeps us from living. I have been so guilty of this: having to take pictures no matter what's going on so I can post it to Facebook, Instagram, or even one of my blogs. I ended up feeling like I didn't really experience what was going on. A couple of weekends ago one of my sons graduated from law school. I went in armed with my phone and my "big girl camera". I have to say I was quite relieved when I saw my brother-in-law with his camera all set up on a tripod, ready to snap away. I was able to sit back and really take in his graduation without worrying about getting pictures. I put my phone in my pocketbook and didn't take it out until we found my son outside of the arena following the ceremony. I didn't miss a thing, and I definitely didn't miss taking pictures! None of my 3 adult sons are big into social media, and I like that about them. I like that they are all about "living in the moment" and not feeling the need to record everything they do. One of my sons isn't on any kind of social media at all. He said that it's not "real life". That's exactly what Matthew Kelly says in his book. "Social media robs us of life. It takes our focus off living life and shifts it to presenting a false image of ourselves and our lives to other people." What I wouldn't give for my son to spend some time with Mr. Kelly! 1) Check out who is following you. If the person's posts raise eyebrows, block him/her. 2) Only put things on social media that you would want your grandmother to see. Another litmus test: if it was on the front page of your local newspaper, would you be embarrassed? 3) Put your phone down. Better yet, disable all of the notifications (visual and audible) for social media outlets so you aren't tempted. 4) Never, ever buy a smartwatch. I'm actually a bit amazed that people are so attached to their social media or emails that they can't live without one. 5) Limit how long you are on social media. Set a timer if you have to. When the timer goes off, just walk away. It really isn't hard. So, yes. Social Media can be a good thing if used for good, not evil. I know some people who will completely ban it from their lives during Lent. That's not a bad thing, but you don't have to go to that extreme. If you limit what you're putting out there and limit the time, it doesn't have to take over your life and become a god. 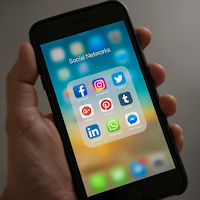 Want more information on Social Media and Catholics? * The USCCB has guidelines for Social Media for church personnel. * Interesting stats on social media is provided by the National Catholic Register. * Pope Francis called texting and social media "gifts from God". ***This post has been linked to Worth Revisiting sponsored by Theology is a Verb and Reconciled to You. It is definitely a time thief! Good thoughts and good information. I am not attached to my phone but admit it is never far from reach. Such a timely post! When social media started to really kick up, I had deliberately made a plan to disconnect. I needed to find out what I wanted to do with it. Like you, I know that it can be used for good. I just needed to get my mind in the game about that. Now, I love to use it to bring greater glory to God. If I’m not doing that, then there is no reason for me to mess with it.